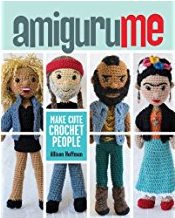 CRAFTYisCOOL: Custom Amigurumi: That's What! So what did I do all Christmas season? Certainly not blog, that's apparent. Yeah, sorry. Sometimes I feel like if I don't have something witty to say I better just keep my mouth blog shut. But today was an extra glorious day, and I had to sit and relate a little at the end of it! Can you see Aaron Bleyart and me have a mutual admiration for the word "awesome"? I think he and Conan are both awesome too! Conan art is awesome! Fan art in general is pretty awesome too, don't you think?? Somebody get me on a plane to LA! Seriously!! In other, ahem, awesome news, I made some really cool custom orders for Christmas this year! I love when people give me their hot ideas. It makes my job much easier! I made this really fun pair of dolls modeled after Lalaloopsy dolls that were a hot toy this season. The mother who ordered them wanted their girls to have a more "lovey" version that wouldn't jab them in the eyeballs or leave scary indentations on their faces while they slept. So of course, a crocheted version fit that bill! 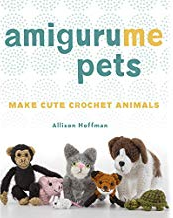 They were both pretty big, used a ton of yarn, and they each had their own little crocheted clothes and pets! I got another custom order for a lookalike doll, which I am loving doing! This special someone plays a ukelele and is into mod-retro Mad Men-ish fashion, so he got yarn-transformed into this guy. So why haven't I done any Muppets?? Ughhhh I love the Muppets. There's lots I want to do, and I got kind of a kickstart when someone ordered Mew from The Christmas Toy . He wanted a working puppet, and he got it! He was a Christmas gift from a *very* loving grandson to his grandpa. They have watched the movie together every year and he wanted to give him a sweet little Mew. Isn't that story even sweeter than the mouse?! Now can someone PLEASE order a Janice doll?!?!!? I am really excited to be getting published for the first time in a magazine! Spool magazine is a new needlearts publication with not just crochet, but also knitting, felting, embroidery, cross-stitch, and needlepoint. The editor asked me to come up with something so I made this set of nesting penguins. The pattern is out now in the Winter 2011 issue. Ask your local yarn store to get Spool! Last of all, I'm going to be teaching another class this month here in Austin at the Knitting Nest. I love teaching! 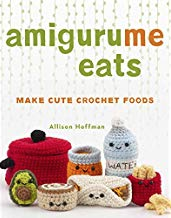 We'll be doing a beginning amigurumi class and making Baby Monsters! The class is on Saturday, January 22 at 10:30 am. You must sign up ahead of time. Call Stacy for the details and to get your name on the list! I've had an amazing 2010! I hope you all have too, and if not, well, 2011 is right around the corner! Don't feel bad if you don't have any serious plans for the 31st! Think of me at midnight. I'll be playing Dance Central on Kinect, drinking some Cook's Brut, dipping into a chocolate fountain with a strawberry. I WILL master Bell Biv Devoe's "Poison". I will. Or maybe I'll just crochet. Whatevs. Congrats on all of your successes!! All of it is soo incredibly exciting! And I have to say, your patterns are awesome! ;) I made the Astro for my husband for Christmas and he freakin' loved it. Even though I've never made an amigurumi before, you made it pretty straight forward and it was super fun and I didn't get stressed at all! You'll be seeing me back for a peewee and chairy very soon :) Hope you have a fantastic new years! Your work is amazing - do you sell your items? If so, where can we go to look/drool/purchase? Mostly patterns right now and I do custom orders occasionally. 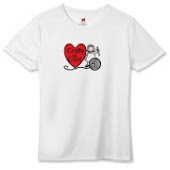 Allison - found your site - its amazing. I havent a creative bone in my body but my daughter is head over heels for the lalaloopsy patterned dolls - any chance i could get some more info on a custom order? Your lalaloopsy dolls are way cuter than the real thing! Do you sell the pattern for the Lalaloopsy look-alikes? They are so amazing! @Sinead -- Thanks so much! i love your work! my baby sister is turning 5 and here birthday party theme is the lalaloopsy dolls and i was wondering if you sale your work, and if so, how much, this would be perfect to give out to all her friends with the goody bags.thanks. I love your work on the hook. I was Dolly, but I have a concern to the R4 of the body: I have 9 stitches on the R3 and if I am the explanations of the R4 I can not get 12 stitches final .. I would love the pattern for the Lalaloopsy dolls to make for my grand daughters. Where can I purchase it please. My daughters would love the lalaloopsy dolls, could you please email the cost for the pattern? cinderellastory83@gmail.com thank you. OMG its Mew!!! I cant believe other people know The Christmas Toy! I watched it as a kid and now my daughter makes me watch it over and over again. I love it!! You did a wonderful job. I love the Lalaloopsy too! Smart idea. I dont really get the real ones. My daughter got one as a gift and it makes no sense at all. It's oversized heavy head droops everywhere. She's not really sure how to play with it, lol. The soft ones make more sense. After seeing your creations, I am so inspired! Thank you for sharing, and happy crafting to you. Is there a way to get your doll pattern? My girls love the lalaloopsy dolls. me too, i want the pattern please!! N/m, just saw the pattern!